474. Æolipile or Hero’s steam toy, described by Hero, of Alexandria, 130 years B.C., and now regarded as the first steam engine, the rotary form of which it maybe considered to represent. 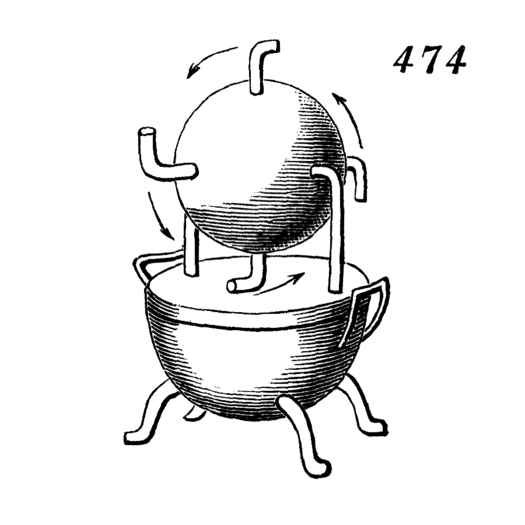 From the lower vessel, or boiler, rise two pipes conducting steam to globular vessel above, and forming pivots on which the said vessel is caused to revolve in the direction of arrows, by the escape of steam through a number of bent arms. This works on the same principle as Barker’s mill, 438 in this table.